Hunting can be a necessity, but not a way of having fun. In a world where urbanization, pollution and poaching threaten the planet’s wildlife and cause a dying of species 1000 times faster than natural, civilized countries should educate their members teaching respect for all living beings and forbid any unnecessary killing. 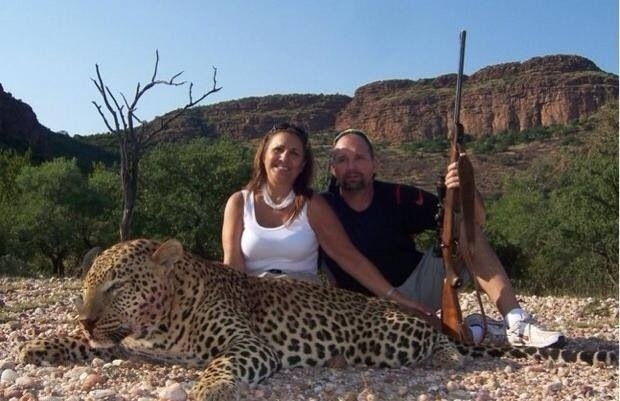 What can I or anyone say this dreadful pair actually look pleased with themselves! Who are they to take it upon themselves to end a life – and enjoy doing it! It’s time these pathetic people understood that the animals they kill are far more important to this planet than they could ever be. The death of this beautiful creature means something to us all – theirs, on the other hand, would probably mean very little to anyone.